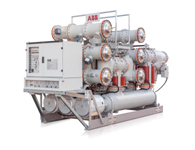 Zurich, Switzerland, April 23, 2012 – ABB, the leading power and automation technology group, announced the launch of its new generation 420kV (kilovolt) Gas Insulated Switchgear (GIS) at the Hannover Fair being held in Germany from 23-27 April 2012. The new design reduces product volume by up to 33 per cent (width x depth x height) compared to its predecessor resulting in a considerably smaller footprint. The compactness of the unit makes it ideally suited for installations where space is a constraint and also reduces the amount of SF6 insulating gas requirement by as much as 40 percent making it more environmentally friendly. It is also designed to enhance resource efficiency by reducing thermal losses, lowering transportation costs and optimizing investment in infrastructure. The new GIS can be factory assembled, tested, and shipped as one bay in a container instead of multiple assembly units, saving site installation and commissioning time by up to 40 percent compared with traditional designs. Frontal access to drives, position indicators and service platforms enable easier operation, inspection and maintenance. Standardized modules and connection elements also enable flexibility in terms of configurations and building optimization. The product features a fast single-interrupter dual motion circuit breaker and has been designed for current ratings up to 5000A (amperes). It is capable of providing protection to power networks with rated short-circuit currents up to 63kA (kilo amperes). In a power system, switchgear is used to control, protect and isolate electrical equipment thereby enhancing the reliability of electrical supply. With GIS technology, key components including contacts and conductors are protected with insulating gas. Compactness, reliability and robustness make this a preferred solution where space is a constraint (e.g. busy cities) or in harsh environmental conditions. ABB pioneered high-voltage GIS in the mid-1960s and continues to drive technology and innovation, offering a full range product portfolio with voltage levels from 72.5kV to 1,100kV. As a market leader in high-voltage GIS technology, ABB has a global installed base of more than 20,000 bays. ABB (www.abb.com) is a leader in power and automation technologies that enable utility and industry customers to improve their performance while lowering environmental impact. The ABB Group of companies operates in around 100 countries and employs about 135,000 people. An electrical sub-station is an assemblage of electrical components including busbars, switchgear, power transformers, auxiliaries etc. These components are connected in a definite sequence such that a circuit can be switched off during normal operation by manual command and also automatically during abnormal conditions such as short-circuit. Basically an electrical substation consists of No. of incoming circuits and outgoing circuits connected to a common Bus-bar systems. A substation receives electrical power from generating station via incoming transmission lines and delivers elect. power via the outgoing transmission lines. Sub-station are integral parts of a power system and form important links between the generating station, transmission systems, distribution systems and the load points. Controlling the Exchange of Energy. Ensure steady State & Transient stability. Load shedding and prevention of loss of synchronism. Maintaining the system frequency within targeted limits. Voltage Control; reducing the reactive power flow by compensation of reactive power, tap-changing. Securing the supply by proving adequate line capacity. Data transmission via power line carrier for the purpose of network monitoring; control and protection. Fault analysis and pin-pointing the cause and subsequent improvement in that area of field. Determining the energy transfer through transmission lines. Reliable supply by feeding the network at various points. Establishment of economic load distribution and several associated functions. Classification based on voltage levels, e.g. 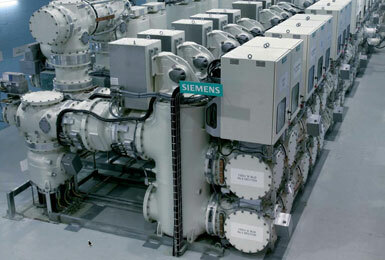 : A.C. Substation : EHV, HV, MV, LV; HVDC Substation. Classification based on Outdoor or Indoor : Outdor substation is under open skv. Indoor substation is inside a building. Step Up Substation : Associated with generating station as the generating voltage is low. Primary Grid Substation : Created at suitable load centre along Primary transmission lines. Secondary Substation : Along Secondary Transmission Line. Distribution Substation : Created where the transmission line voltage is Step Down to supply voltage. Bulk supply and industrial substation : Similar to distribution sub-station but created separately for each consumer. Mining Substation : Needs special design consideration because of extra precaution for safety needed in the operation of electric supply. Mobile Substation : Temporary requirement. Primary Substations receive power from EHV lines at 400KV, 220KV, 132KV and transform the voltage to 66KV, 33KV or 22KV (22KV is uncommon) to suit the local requirements in respect of both load and distance of ultimate consumers. These are also referred to ‘EHV’ Substations. Secondary Substations receive power at 66/33KV which is stepped down usually to 11KV. Each sub-station has the following parts and equipment. Substation Equipment such as Circuit-beakers, Isolators, Earthing Switches, Surge Arresters, CTs, VTs, Neutral Grounding equipment. Station Earthing system comprising ground mat, risers, auxiliary mat, earthing strips, earthing spikes & earth electrodes. Overhead earthwire shielding against lightening strokes. Galvanised steel structures for towers, gantries, equipment supports. PLCC equipment including line trap, tuning unit, coupling capacitor, etc. 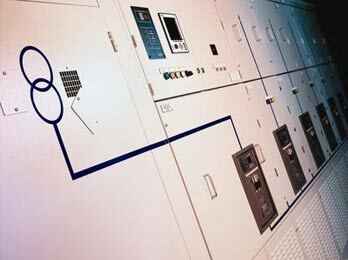 An important function performed by a substation is switching, which is the connecting and disconnecting of transmission lines or other components to and from the system. Switching events may be “planned” or “unplanned”. A transmission line or other component may need to be deenergized for maintenance or for new construction; for example, adding or removing a transmission line or a transformer. To maintain reliability of supply, no company ever brings down its whole system for maintenance. All work to be performed, from routine testing to adding entirely new substations, must be done while keeping the whole system running. Perhaps more importantly, a fault may develop in a transmission line or any other component. Some examples of this: a line is hit by lightning and develops an arc, or a tower is blown down by a high wind. The function of the substation is to isolate the faulted portion of the system in the shortest possible time. There are two main reasons: a fault tends to cause equipment damage; and it tends to destabilize the whole system. For example, a transmission line left in a faulted condition will eventually burn down, and similarly, a transformer left in a faulted condition will eventually blow up. While these are happening, the power drain makes the system more unstable. Disconnecting the faulted component, quickly, tends to minimize both of these problems. 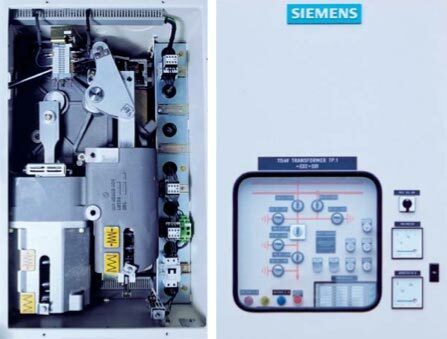 A fundamental feature of Siemens gas-insulated switchgear is the high degree of versatility provided by its modular system. Depending on their respective functions, the components are housed either individually and/or combined in compressed gas-tight enclosures. With a remarkably small number of active and passive modules, all customary circuit variants are possible. Sulphur hexafluoride (SF6) is used as the insulating and arc-quenching medium. Three-phase enclosures are used for type 8DN8 switchgear in order to achieve extremely low component dimensions. This concept allows a very compact design with reduced space requirement. Aluminium is used for the enclosure. This assures freedom from corrosion and results in low weight of the equipment. The use of modern construction methods and casting techniques allows optimizing the enclosure’s dielectric and mechanical character- istics. The low bay weight ensures minimal floor loading and eliminates the need for complex foundations. All the modules are connected to one another by means of flanges. The gastightness of the flange connections is assured by proven O-ring seals. Temperature-related changes in the length of the enclosure and installation tolerances are compensated by bellows-type expansion joints. To that end, the conductors are linked by coupling contacts. Where necessary, the joints are accessible via manway openings. Gas-tight bushings allow subdivision of the bay into a number of separate gas compartments. Each gas compartment is provided with its own gas monitoring equipment, a rupture diaphragm, and filter material. The static filters in the gas compartments absorb moisture and decomposition products. The rupture diaphragms prevent build-up of an im- permissible high pressure in the enclosure. A gas diverter nozzle on the rupture diaphragm ensures that the gas is expelled in a defined direction in the event of bursting, thus ensuring that the operating personnel is not endangered. The design of the interrupter unit and of the operating mechanism is based on proven and in most cases identical designs, which have often been applied for outdoor switchgear installations. 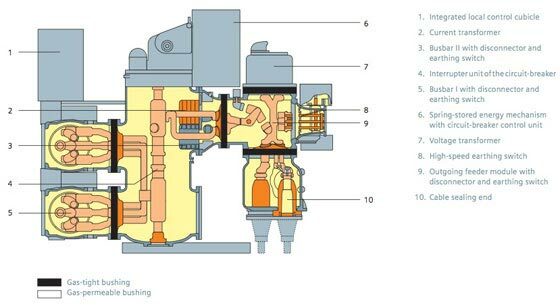 The spring-stored energy operating mechanism provides the force for opening and closing the circuit-breaker. It is installed in a compact corrosion- free aluminium housing. The closing spring and the opening spring are arranged so as to ensure good visibility in the operating mechanism block. The entire operating mechanism unit is completely isolated from the SF6 gas compartments. Anti-friction bearings and a maintenance-free charging mechanism ensure decades of reliable operation. The functions of a disconnector and an earthing switch are combined in a three-position switching device. The moving contact either closes the isolating gap or connects the high-voltage conductor to the fixed contact of the earthing switch. Integral mutual inter- locking of the two functions is achieved as a result of this design, thus obviating the need for providing corresponding electrical interlocking within the switchgear bay. An insulated connection to the fixed contact of the earthing switch is provided outside the enclosure for test purposes. In the third neutral position neither the disconnector contact nor the earthing switch contact is closed. The three poles of a bay are mutually coupled and all the three poles are operated at once by a motor. Force is transmitted into the enclosure via gas-tight rotating shaft glands. The check-back contacts and the on-off indicators are mechanically robust and are connected directly to the operating shaft. Emergency operation by hand is possible. The enclosure can be provided with inspec- tion windows, in the case of which the “On” and “Off” position of all three phases is visible. The outgoing feeder module connects the basic bay with various termination modules (for cable termi- nation, overhead line termination and transformer termination). It contains a three-position switching device, which combines the functions of an outgoing feeder disconnector and of a bay-side earthing switch (work-in-progress type). Installation of a high-speed earthing switch and of a voltage transformer is also possible where required. The high-voltage site testing equipment is generally connected to this module. Connections between the bays are effected by means of busbars. The busbars of each bay are enclosed. Adjacent busbar modules are coupled by means of expansion joints. The module contains a three-position switching device, which combines the functions of a busbar disconnector and of a bay-side earthing switch (work-in-progress type). Bus sectionalizers are used for isolating the busbar sections of a substation. They are integrated in the busbar in the same manner as a busbar module. The module contains a three-position switching device, which combines the functions of a bus sectionalizer and of an earthing switch (work-in-progress type). The high-speed earthing switch used is of the so-called “pin-type”. In this type of switch, the earthing pin at earth potential is pushed into the tulip-shaped fixed contact. The earthing switch is equipped with a spring-operated mechanism, charged by an electric motor. All the elements required for control and monitoring are accommodated in a decentralized arrangement in the high-voltage switching devices. The switching device control systems are factory-tested and the switchgear is usually supplied with bay-internal cabling all the way to the integrated local control cubicle. This minimizes the time required for com- missioning and reduces the possibilities of error. By default, the control and monitoring system is implemented with electromechanical components. Alternatively, digital intelligent control and pro- tection systems including comprehensive diagnos- tics and monitoring functions are available. More detailed information on condition of the substation state permits condition-based maintenance. This consequently reduces life cycle costs even further. as soon as they arrive at the defined response thresh- old. The optionally available monitoring system includes sensors that allow remote monitoring and trend forecasts for each gas compartment. Control and feeder protection are generally accom- modated in the local control cubicle, which is itself integrated in the operating panel of the switchgear bay. This substantially reduces the amount of time and space required for commissioning. Alternatively, a version of the local control cubicle for installation separate from the switchgear is available. Thus, different requirements with respect to the arrange- ment of the control and protection components are easy to meet. The cabling between the separately installed local control cubicle and the high-voltage switching devices is effected via coded plugs, which minimizes both the effort involved and the risk of cabling errors. Of course we can supply high-voltage switchgear with any customary bay and substation control equipment upon request. We provide uniform systems to meet your individual requirements. intelligent, uniformly networked digital control and protection systems with supplementary monitoring and telediagnostics functions. Given the wide range of Siemens control and protection equipment, we can provide customized concepts with everything from a single source. 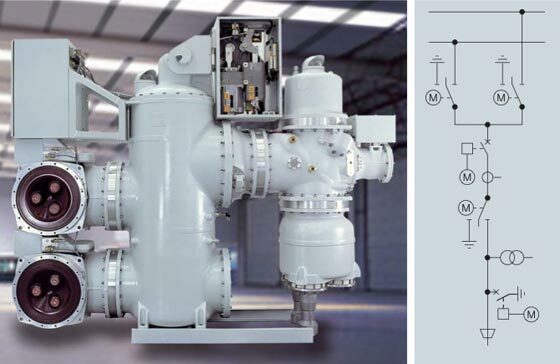 Siemens gas-insulated switchgear is designed and manufactured so as to achieve an optimal balance of design, materials used and maintenance required. The hermetically-sealed enclosures and automatic monitoring ensure minimal switchgear mainte- nance: The assemblies are practically maintenance- free under normal operating conditions. We re- commend that the first major inspection be carried out after 25 years.